When it comes to generating free real international number I love to go with just one but best. If you run numerous service online that requires international phone number to verify you account you know the quality of getting a real number and not fake international number generators. Today, I intend to share with you the Primo Android review to make free international call, and get free USA real phone number. The Android app is put together by www.primo.me. If you really want to get real phone number for yourself there are some things to consider. It’s far more than, is it possible to make free international calls with it just like whatsapp? Some people are more concern about primo free call for PC but here I’m of interest on how to get free international number to verify online account such as Fiveer for a token, how to make free international call on primo, how to earn free minutes to call on primo, and how to login to primo account on PC. I engaged in so many online business that requires USA phone number. But I’m not from the state which means I need a someone to help me verify the account using their phone number. With Primo Android app you can stay right their in your country and verify your online account such as Fiveer account as an international person as if you live in the state. A reliable and truthworthy USA mobile generator should be up and doing. It should be able to deliver to it purpose. It should be ready to proof that you effort placing an order is only thing you need to do to enjoy what you paid for. And for this goal, I recent got to know about Primo Android app free download for free call on Android and on PC. You can also use Primo app on PC to make free call and generate international mobile number. I actually got to know about Primo app when I was searching for USA mobile number to confirm Fiveer account. And I got Primo review from most popular website that with just $2 I can get a real USA phone number for a whole year and also make free call over the internet without paying a dine. What I do really love about Primo is that it doesn’t require any technical understanding as if you are going for spelling bee competition. Once you downloaded the app on your device, right now they support both Android and iOS, primo.me also support web like whatsapp web, Instagram web called primo web. and you can also use it on PC through Bluestacks. When you burgle into this app after downloaded you will be prompted to login with your phone number if you already have an account with them or sign up for a new account. And since you are new to primo, you first need to sign up using your mobile phone. Primo.me Android app is currently available for both Android and iOS device as well as web browsers. For windows phone, you can install primo.me apk app to make free international call and enjoy free chat on your smartphone for free. You first need to download Primo app for your device and install it once downloaded. For Android and iOS devices. Launch the installed free international phone number generator and you will be asked to either login or sign up for a new account. The click on sign up for a new account. Don’t be panic it’s not yet an international number. Just use your local number and make sure to select appropriate country code from the drop menu. Note: You can always earn extra minutes to make calls on primo by telling your friends about it. We’ll come to that later in this post. Once you entered you phone number primo will send a verification code to your number. Make sure that the number you entered is within your reach and that it can also receive text messages. Enter the verification codes sent to your phone number and click on done to proceed to the next step. 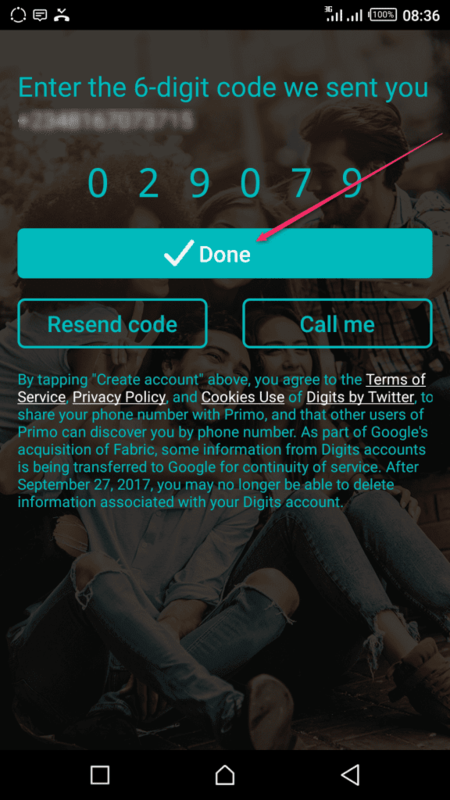 If the code didn’t arrive within 15 minutes of request you can click on resend code for primo app to resend activation codes again or use call me for a call directly from primo app to dictate your phone number verification codes. A new window will pops up for more details. Fill the information columns correctly with your real information and click on sign up. The we are good and done with primo app registration. Congratulations you are now part of primo free call app community. Let see next on how to generate real international phone number. Primo.me Android app offers a handy ways of generating an international phone number for just a token. And I believed this is the part you really want to read. It won’t cost you are fortune to own an international phone number for your online business for just a token. However, here is how to generate international phone number using free call app called ‘primo app’. Launch the primo app you installed on your Android or iOS device. First you will be taken to your account page with few options such as my account, shop now, primo US phone number, international calling plan, credits and referral minutes. Hover to primo US phone number and click on activate option. Note: Your primo phone number receive incoming call and SMS for free! Primo plans are divided into two. Monthly plan and yearly plan. The monthly plan goes for $.099 while the yearly plan goes for $4.99. Meanwhile you also have a free trial to test run your primo US international number. Then, click on any of the plan, to start with you can go for monthly plan for just $.099 and click on buy. A new wind will pops up then select your means of payment and click on buy to take you to payment page on your primo app. You can also make payment directly from play store. A new window will pops from below your device then select credit or debit card as your means of payment and if you have PayPal you can opt in for PayPal as your means of payment. On the next page enter your credit card details such as card number, expiring date, CVV, postal code and click on add card to add your new card. Note: Due to my account privacy I choose not to share card page screenshot! After that you account will be credited with 1 monthly free international call. Note that after a month your account will be suspended and for this, I strongly recommend you go for a year plan for just $4.99. Primo.me company offers a handy ways of earning free credit on your account to make free call across the globe. They are easy and doesn’t require a rocket scientist knowledge to get started. They following ways are how to earn calling credit on Primo.me app. You earn call credit when any of your friends accepted your invitation to use Primo app to make free call and chat for free. www.primo.me offers free credit when you complete a lock screen survey. To start this you need to enter your birth day date, gender, and then enable lock screen so that you can earn. This way you can earn unlimited free calling credit to make free international call on your smartphone and on primo web page. What is you take about primo app? What is your suggestion for www.primo.me admins to improve this app? Please share you mind with us in the comment section.